It's time for another fun sketch from the My Favorite Things Challenge & Inspiration Blog! Enjoy creating with this versatile sketch. Below you'll find Sketch 290. Create cards, scrapbook layouts, home decor, treat containers, mixed media, etc. using this week's sketch and be sure to link your project below for a chance at the weekly My Favorite Things Gift Voucher worth up to $20. The My Favorite Things Creative Team has been busy getting creative! Let's see what they have up their sleeves for Sketch 290! Keeway's design is a direct interpretation of Sketch 290, and how lovely it is! She uses the rectangle as a spot to feature a homey living room scene she created with the Make Yourself at Home stamp set and Die-namics. Jody has a creative take on the sketch! You can see that the main rectangle is larger on her design, and the sentiment and palm tree from the You're Rawr-some stamp set create the illusion of the flags of the sketch. She's also created more line with the very subtle stamping she did with the Distressed Patterns stamp set. Fun! 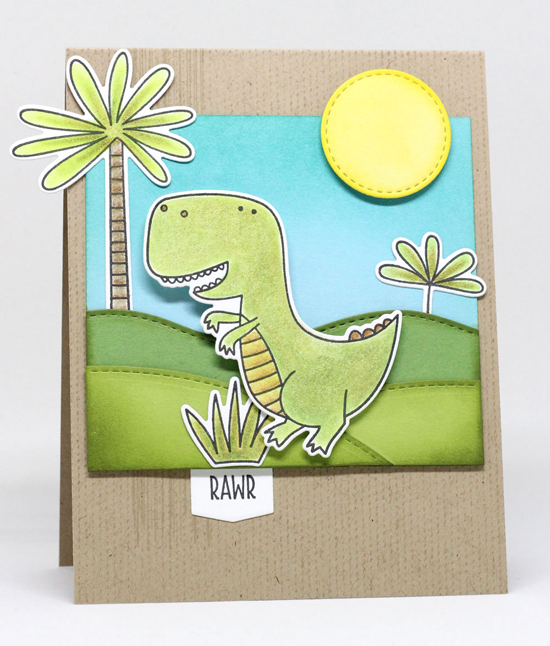 Join me in welcoming back Jenn Shurkus as our Guest Designer this month! In true Jenn-style, this design is artsy and cute all at once. I'm especially enamored with the flags that she created underneath the sentiment using the Transparent Triangles Background stamp. It totally looks like patterned paper! 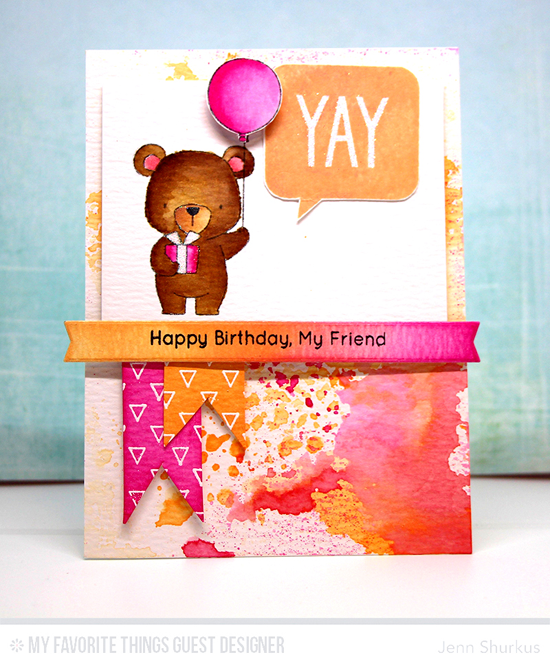 And how sweet is that dear little bear from the Beary Special Birthday stamp set? 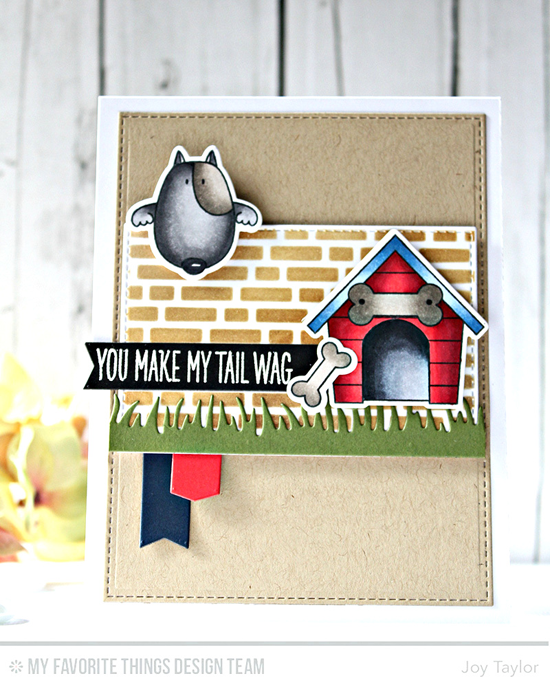 Joy followed the sketch quite closely like Keeway, but her design has a much more whimsical feel with her use of the You Make My Tail Wag stamp set. I love how she has one of the pups peeking over the wall that she created with the English Brick Wall stencil! Amy was inspired by the flags at the top and the bottom of the sketch, but her flags are represented by the Simple Leaf Flourish in pure white. 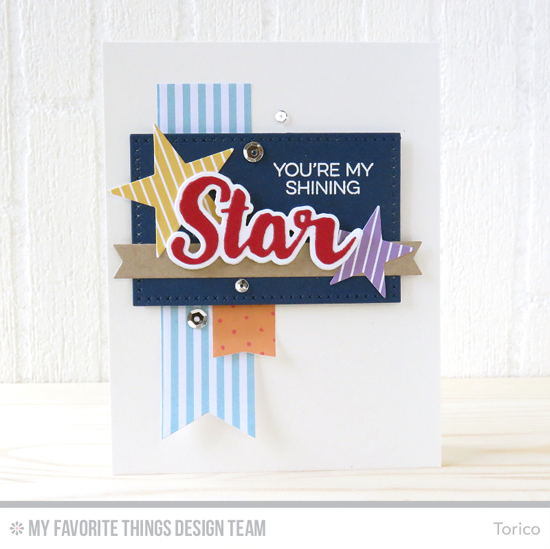 They give such a delicate flair to the gorgeously stamped panel and the lovely sentiment. 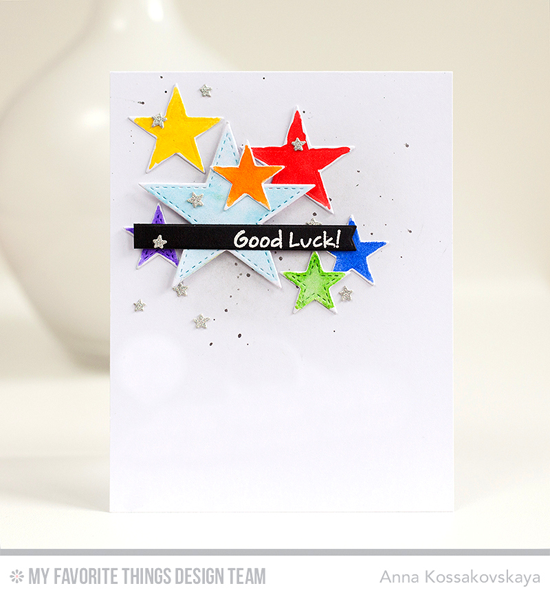 Anna creates the illusion of the rectangular panel with the placement of her colorful stars and then tops off her clean and graphic design with a bold and simple sentiment. Does it look much like the original sketch? Not at all, but when a sketch results in a great design, it doesn't have to! 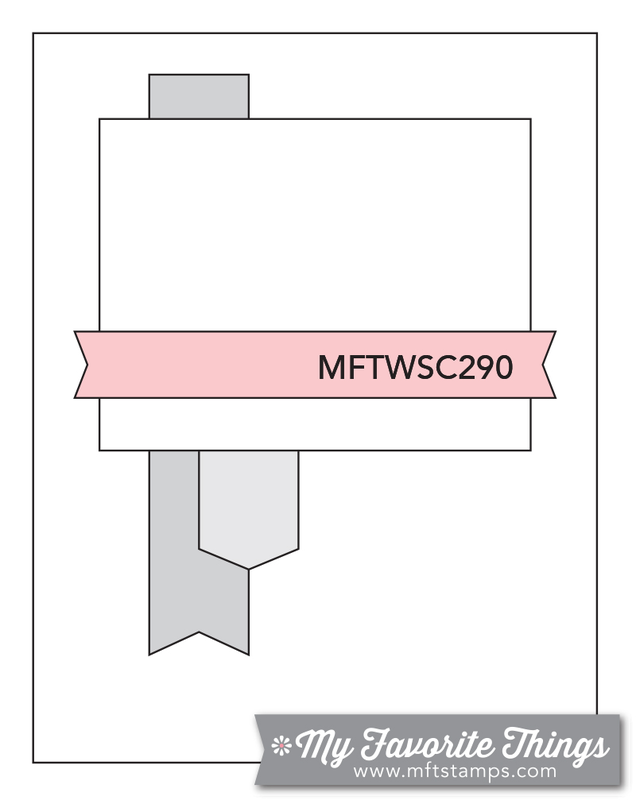 You have until Tuesday, July 26th, at noon EDT to add your link and be eligible for the prize of up to $20 in MFT Cash to be spent in the MFT boutique. Winners are chosen at random, so everyone has a chance! The weekly prize is a $15 Gift Voucher to My Favorite Things, but if you use MFT stamps and/or dies in your project, you’ll receive an extra $5. What a great sketch! All the designers did a beautiful job on all their creations. Can't wait to try this one myself! Thank you so much for the gift voucher! Love the sketch and all the amazing cards!! !